Shallots are a member of the allium family, along with onions, garlic, and many ornamental plants. They multiply in the ground like garlic, but have concentric rings, like onions. They also have a mild, subtle onion flavor that makes them very popular with chefs. Shallots are actually very easy to grow, despite their high price in grocery stores. Shallots belong to a group generally called multiplier onions. And although taxonomically, there is no such thing as a true shallot, not all multiplier onions are considered shallots. Leaves: Long, straight, blue-green, hollow and succulent. Flowers: The white umbel allium flowers bloom on a long, stiff flower stalk that is usually removed, to provide more energy to the bulbs. Smaller than bulbs of garlic, but it depends on the variety and how well they grew. Shallots are ready to harvest in three to six months. You can cut some of the green tops to use as green onions, but leave some to feed the plants. Fall planted shallots will be ready to harvest early the following summer. Spring planted shallots should be ready in mid to late summer, depending on the weather. 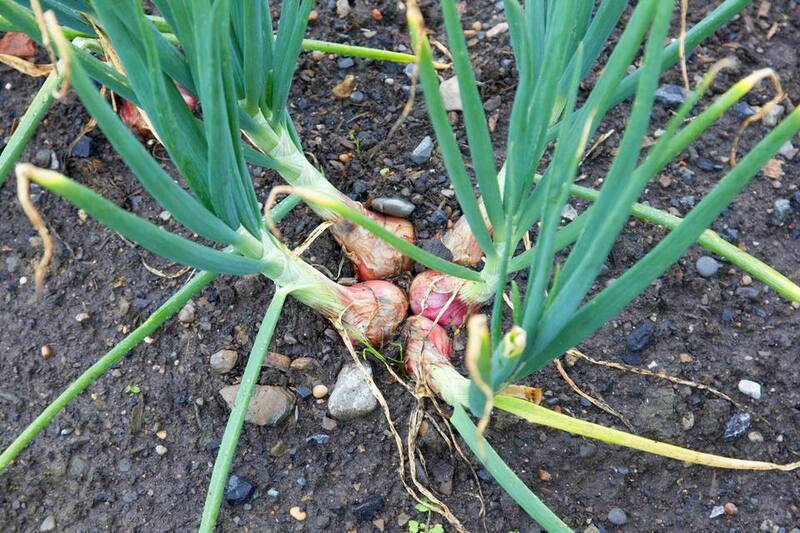 As with onions, shallots will signal they are ready to be dug when their tops start to yellow and fall. Shallots have a mild onion/garlic flavor and can be used any in any recipe calling for onions, where you want a milder taste. They are especially good sauteed in butter and added to recipes. Shallots can also substitute for scallions or spring onions. Since shallots are mild, they are great raw or cooked. 'French Gray': Considered by most to be the only true shallot and the one favored for gourmet cooking. 'French Red' Shallot: Spicy flavor and easy to peel. 'Frog's Frong's Leg' Shallot: Very mild. Long and elongated, like a frog's leg. 'Ambition' Shallot: Large French shallot which stores very well. Conservator' Shallot: Similar to 'Ambition' but larger and rounder. Shallots can over-winter from about USDA Hardiness Zones 3 to 10, but you'll get better quality and yield if bulbs are dug and replanted in the fall. Shallots should be grown in full sun to partial shade. White Rot: Attacks the roots and base of the bulb. It can persist in the soil, so scallions should not be grown there again for 5 to 8 years. Neck Rot: Attacks the neck and leaves of the plant. This is also soil born. Don't plant in the same area for 2 years. Onion Fly Larva: Burrow into bulbs. Planting carrots nearby will deter them. Shallots like a slightly acidic soil pH of about 6.0 to 6.8, although they will tolerate a more neutral soil. Give them rich soil with lots of organic matter. You can start shallots from seed, but they rarely set seed, so they are hard to find. Shallots grown from seed will take longer to mature and will require more attention while young. Shallots are usually grown from sets, or bulbs and are planted very much like garlic cloves. They can be planted in either the fall or spring. In warm climates, fall is better. In cool climates, get them in the ground by mid-October or wait until early spring. Separate each bulb and plant them 4 to 6 inches apart, with the pointed end facing up. Plant them just below the soil surface. Unlike garlic, which forms a larger bulb, shallots tend to spread out a bit, into a cluster of 5 or 6, so they need more room than garlic. Shallots prefer rich, loose soil. Compacted soil will yield smaller bulbs. Don't mulch your shallots, but you can side dress them with organic matter in early spring. Shallots need plenty of water, throughout the growing season. Just make sure the soil is well-draining and they are not sitting and rotting in wet soil. Cut back any flower stalks, to put the energy back into the bulbs. Some gardeners like to trim the leaves back by a third, for the same reason. If you leave shallots in the ground, they will re-sprout, however, the quality is better if they are dug and replanted. So save some of your best bulbs to replant.